Gentle Care Animal Hospital offers internal veterinary medicine by skilled professionals in a compassionate setting. Our commitment to comprehensive internal medicine is extended to dogs, cats, birds, reptiles, amphibians, pocket pets, and other exotic mammals. Our diagnostic capabilities are enhanced by our advanced technology, offering such tools as ultrasound, video endoscopy, and digital radiography. The Gentle Care veterinarians use these tools in diagnosing and treating a variety of diseases, and our training extends to identifying veterinary concerns in most small animals, exotic pets, and even wildlife. Along with our advanced imaging technology, we offer X-ray review by a certified radiologist. In treating injuries, illnesses, and chronic conditions, we blend traditional and integrative veterinary medicine including such techniques as stem cell therapy, herbal medicine, acupuncture, and chiropractic treatments. Our procedures are based on the needs and condition of each animal, and our humane approach is devoted to relieving pain and enhancing your pets quality of life. Visit our pain management page for more on this topic. Our aggressive approach to diagnosis often allows us to find a developing problem before it becomes too difficult to treat with less invasive techniques. For those complex medical situations, our veterinary team offers consultation services to our clients. 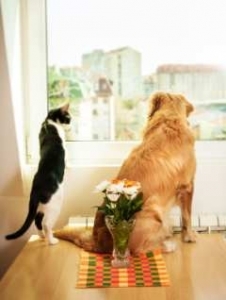 This gives the pet owner an opportunity to explore every possible treatment option for his or her animal companion with an experienced veterinarian. Learn more about this service on our consultations page. Early diagnosis, aggressive treatment, and compassionate care—Gentle Care Animal Hospital meets your needs for excellence in veterinary care and service.